Tradition tells us that Mary was the daughter of Saints Joachim and Anne. They were devoted Jews who raised their child to be loyal and pure within the Jewish holy tradition. Mary was born within the royal line of King David and was betrothed and later married Joseph, a respected Jewish carpenter from Nazareth. Little is known of Mary’s day-to-day life other than the references to her in the Gospels. Those early references indicate that she was a loving, concerned, and devoted person. During her Son’s ministry she attended the wedding feast at Cana, was present at Jesus’ crucifixion, and was most likely with the Apostles at the coming of the Holy Spirit on Pentecost. As the mother of Jesus, and the wife of Saint Joseph, Mary is the greatest saint. She is the model of faith, purity, and maternal devotion for all Christians. Mary is called the Blessed Virgin because she conceived Jesus by the power of the Holy Spirit (this is part of the Mystery of the Incarnation). Saint Joseph is the foster father, not the biological father, of Jesus. To become the mother of the Savior, Mary was “enriched by God with gifts appropriate to such a role.” (Lumen Gentium). Mary freely gave herself to God (confer Chapter 1 in the Gospels of Luke and Matthew), with complete trust even in the face of possible confusion about what was happening to her, and she freely responded and consented to God’s Will for her life. Mary’s “Yes” to God’s request that she become the Mother of the Incarnate Son of God, Jesus, enabled our Redemption to occur. What is the Dogma of the Immaculate Conception? The Church teaches that Mary was conceived without sin. This is the Dogma of the Immaculate Conception which we celebrate today. As The Catechism of the Catholic Church states in paragraph 491, the Dogma of the Immaculate Conception means that “Mary was redeemed from the moment of her conception.” Pope Pius 9th announced this Dogma when he said: “Mary was preserved immune from all stain of original sin.” This was accomplished through the power of God. He willed and acted so that Mary should be free from the stain of sin. Mary, as the angel Gabriel described is “full of grace”… “Hail Full of Grace / Rejoice Highly Favored One.” The Fathers of the Eastern Catholic Church also agree with this truth and verify it when they address the Mother of God as “the All-Holy” (Panagia) and celebrate her as free from any stain of sin. In the year AD 431, at the Council of Ephesus (attended by over 200 bishops from throughout Christendom), Mary was named Theotokos (the God Bearer) and a model of Christian living. “Mary is truly “Mother of God” since she is the mother of the eternal Son of God made man, who is God Himself.” (Catechism of the Catholic Church, 2nd edition, #509). She is called the New Eve because just as the original Eve brought sin and death into the world, Mary, as the bearer of spiritual life, brought Jesus (the New Adam) into the world. This provided the opportunity for grace, redemption, and salvation to impact and transform mankind for all eternity. Since 1964, Mary has been honored as the Mother of the Church. She is called The Mother of the Church because through her free choice she cooperated with God’s plan to build a new “arc of salvation” (the Church) for His people. 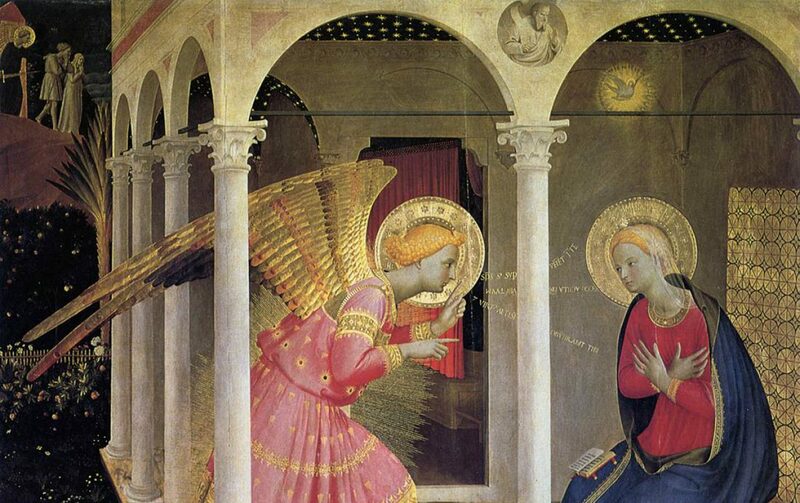 By the eighth century (700’s) the Catholic Church celebrated the Annunciation (Gabriel’s announcement to Mary that she would be the Mother of the Savior), the Presentation of Mary in the Temple, the Assumption of Mary, and the Birthday of Mary. The Immaculate Conception became popular by the tenth century (900’s). Saint Bernard of Clairvaux, Saint Louis de Montfort, Pope John Paul II and many other saints of the Church have written extensively on Mary and her role in the Church and in the lives of individuals. The Church teaches that Mary was assumed into heaven with body and soul united. This is the Dogma of the Assumption of Mary. Roman Catholics, Greek Orthodox, Russian Orthodox, and any of the Eastern Rite Catholic Churches DO NOT worship Mary. WORSHIP IS RESERVED FOR GOD ALONE. These Churches pay respect and reverence to Mary but never worship her. The meaning of Our Blessed Mother Mary for us today is that, especially at this time in history, we must remember that she spiritually intercedes (pleads for mercy on behalf of us – the Church) before the throne of God. She does this in the same way that a mother would intercede with the father on behalf of her children. She loves us with the love of a true mother – for she sees not only our faults but our inherent goodness, too. Please God that we respond to the graces she has to offer us. Hail Mary, full of grace. The Lord is with you. Blessed are you among women, and blessed is the fruit of your womb, Jesus. This painting is by Sano di Pietro an early Renaissance painter. It is entitled Our Lady of Mercy and was painted in the 1440’s. Sano di Pietro was from Siena. This whole article is excellent. It is to be read and meditated carefully.